ux design/research, code, writing, & etc. 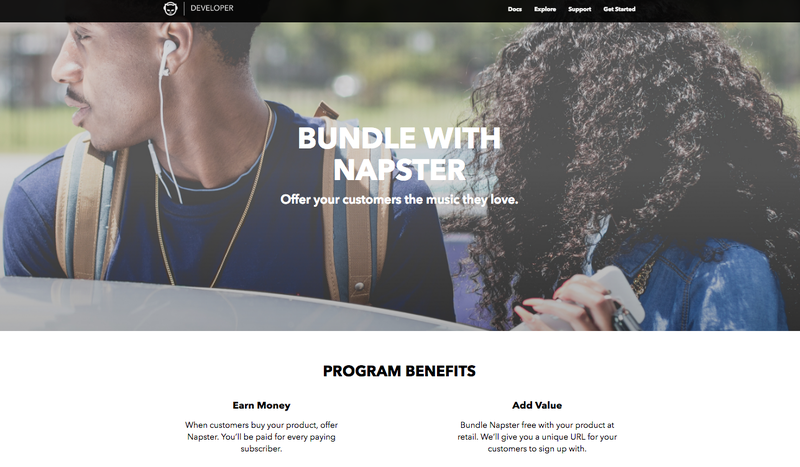 Make it easier for people to know that they can partner with Napster. First, I assisted the API team with deploying a survey to current API users to learn what they wanted out of the portal. We learned of some existing issues, such as confusion about whether developers needed to pay money in order to use the API. 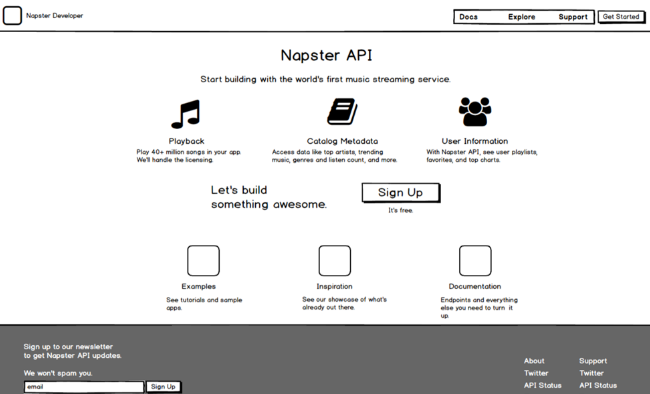 I also confirmed desired outcomes for the website, which included providing clearer information about Napster partnerships, and an easy way for developers to sign up. Competitive analysis on other API sites also gave me more ideas on how to improve the portal design overall. After initial research and sketches, I created a low-fidelity prototype and ran it through usertesting.com to determine the usability issues in the overall layout and content. Participants were screened for familiarity with APIs. Once we found solutions to our main problems, I gave the low-fidelity mockup to our designer. 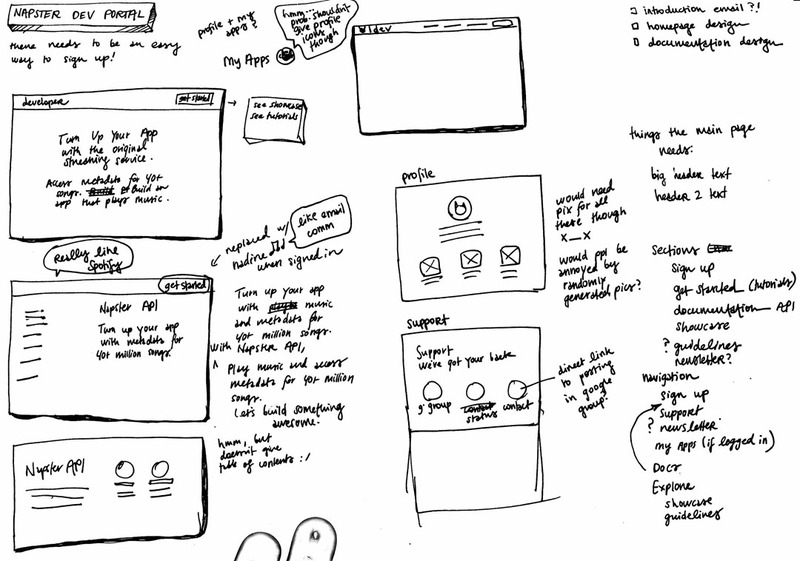 He had enough resources to redesign the homepage; after that, I used his design language to create high-fidelity mockups for the remaining pages, using Sketch. Again, I ran the high-fidelity mockups through a usertesting.com study to ensure the high-fidelity designs were easy to understand. Then, I handed the mockups off to the development team using Zeplin. "First impressions, [this website] looks really in-depth. It looks user-friendly. it pretty much lays out exactly what I need to know about the API. It looks...the fact that they point out there's documentation is great, I like the fact that they offer examples and tutorials. When you're starting out with a new API, that's super helpful." "I'm definitely encouraged by how clean this [design] is, because that indicates to me that the API itself would also be clean. And that is something that I think [Napster] could offer over competitors for sure. Especially since there's a dedicated website to it."